My very first post in this blog was titled "Bright side of Bishan Park", where I included a video showing some birds and dragonflies, and people enjoying the park. Well, when there is a bright side of the park, there is a dark side. I may talk about the dark side in the future. As far as dragonfly diversity is concerned, the stream in Bishan Park is a disappointment. On the average, I can see only a few common species when I visit there. There are ponds around Singapore which are teeming with dragonflies. The one I often visit is a small, humble pond, surrounded by a variety of vegetation, and forest of big trees are nearby. On a good sunny day, the pond is teeming with a variety of species, and lots of activities: territorial fight, courting, mating and ovipositing, just as what this video depicts. Can you see Hydrobasileus croceus ovipositing with contact guarding? 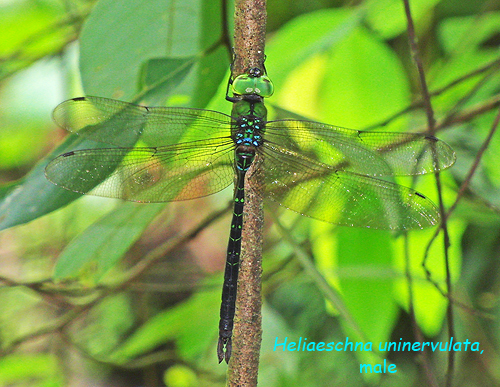 As far as I know, in Singapore, H. croceus is the only libellulid which exhibits contact guarding in flight. I can say that this pond is a healthy habitat for many aquatic creatures. Even though there are stagnant water bodies around, I have never got mosquito bites there. The very, very rare dragonfly, Lesser Nighthawker (Heliaeschna uninervulata) has been seen here a few times. Well, the pond is not within a nature reserve. It is in no way protected. That this pond is such a healthy habitat, besides the vegetation and trees around, is probably due to very little human disturbance. So, there are no litter thrown into the pond, no human beings getting into the pond, no fishing, no animal release, no destruction of vegetation ... I am probably the only human being visiting the pond regularly, and my disturbance to the pond is very minimal. I take only photographs (not creatures away from their habitat), I kill only time (not wildlife), and I leave behind only good memories (not litter). But I have worries. I have seen nice habitats destroyed for good, in the name of development. I have seen the destruction of Tuas marshland destroyed, to make way for a motocross race course. Thus, the only habitat for the critically endangered species, Mortonagrion falcatum, is gone, and the species have never been seen anywhere in Singapore again. I have also seen the destruction of the dragonfly haven in Marina East. I understand that there should be a balance between urban development and nature. But we humans tend to skew the balance too much to our greediness. Very pleased to know we have such a pond. Hope it remains as it is for long. That pond has been my secret hideout for many years.